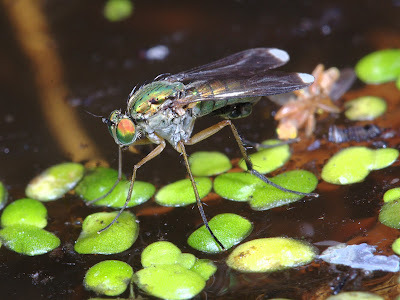 Musings on natural history and nature photography including macro-photography, photos through the microscope and digiscoping. My previous pair of bird watching binoculars were Opticrom Imagic BGA 8x42s bought in February 2000. During a trip to the Spanish Pyrenees in May, we had a couple of very wet days during which my bins got well rained on and subsequently developed internal condensation. Not good! On subsequent investigation, it turns out that one of the barrels has been bashed at some time and was a bit bent - and that had broken the waterproof sealing. I got a quote from Opticron to fix this - £125. So, time for a new pair of binoculars. I did lots of research on the Internet and then went to the Bird Fair to try out a wide range of optics. Since the old pair of Opticrons have done me well for 18 years and I don't feel like paying the crazy prices for the likes of Leica, my research had inclined me towards the latest offerings from Opticron. Before I go any further, I should say that my eyesight is decidedly not of the best! I am 64 and, in 2003 suffered a rather quickly forming and severe cataract in my right eye. This was operated on and I have had an artificial lens since. More recently, a cataract has been steadily forming in my other eye and it is now quite perceptible - putting a slightly yellowish, foggy cast over my vision on that side - although not yet severe enough to operate. So someone younger with perfect vision may definitely be able to perceive differences between optics that are lost on me! The optics pavilion at the Bird Fair allowed me to try out a range of high end bins: Leica, Zeiss, Swarvoski, Kowa and Opticron (at the In Focus stand) next to each other and on the same subjects - a couple of Little Egrets fishing in Lagoon 1. 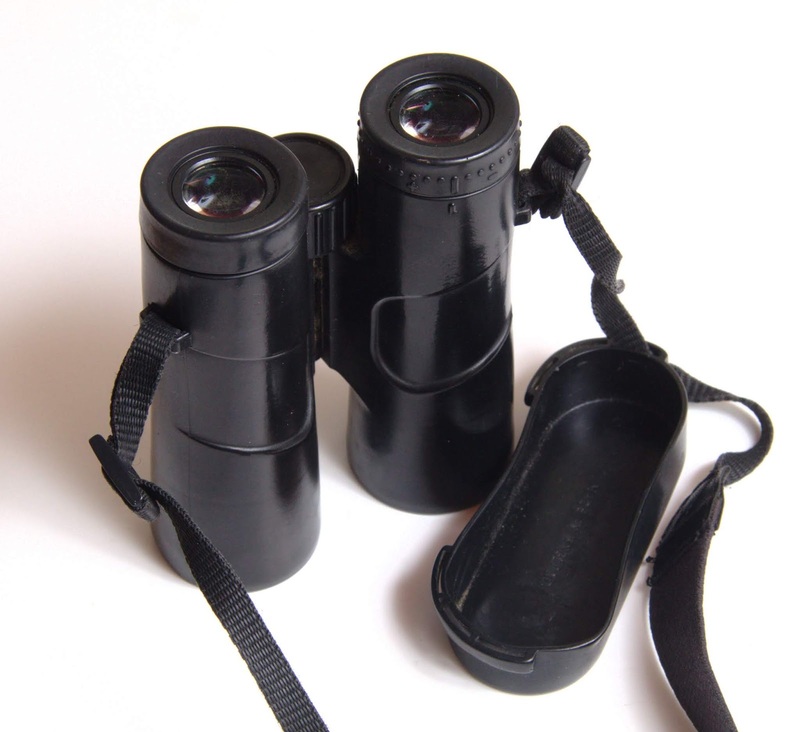 I found that the current, top end binoculars clearly gave a better image than my old Opticron Imagics - brighter, more contrasty - but I could not see any difference between the top brands costing well over £1000 (or over £2000 in a few cases!) and the top end Opticrons costing £300-600. There is not a lot to distinguish them on things like weight, field of view (pretty much identical in all the ones I looked at) or closes focus distance (1.8-2m in all of them with the Opticrons at the low end of this range). So the upshot was - I bought a pair of Opticron DBA VHD+ 8x42. I did also look at the 10x option, but my hands are too shaky these days and I cannot hold them steady enough. I have now had two trips using the new bins - a three day trip round North Norfolk and a week in the Black Isle, northern Scotland plus the local birding in between. So, this review is based on a couple of weeks of intensive, daily use. I have found the new bins extremely good. Physically, they are no different in size or weight from my old ones, but the clarity and brightness of the image is perceptibly better. 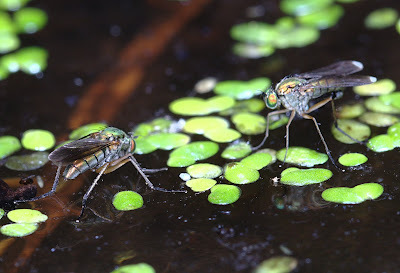 They focus down to about 1.8m - which is useful for dragonflies, and about the same as the old pair. However, I am less happy with the case and strap supplied with them. Fist, let us consider the case. 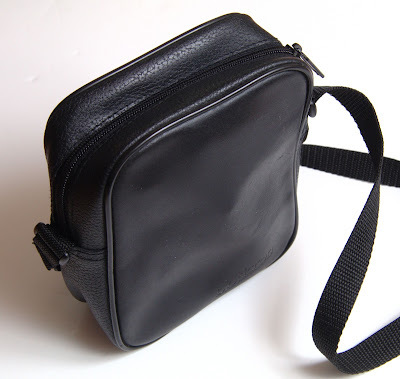 The old Opticron case was a soft leather affair with a zip and its own strap. It has survived 18 years of use with no problems. About the only sign of wear is that the gold-coloured lettering of the Opticron logo has worn off! The new case is a soft Cordura affair with no strap. 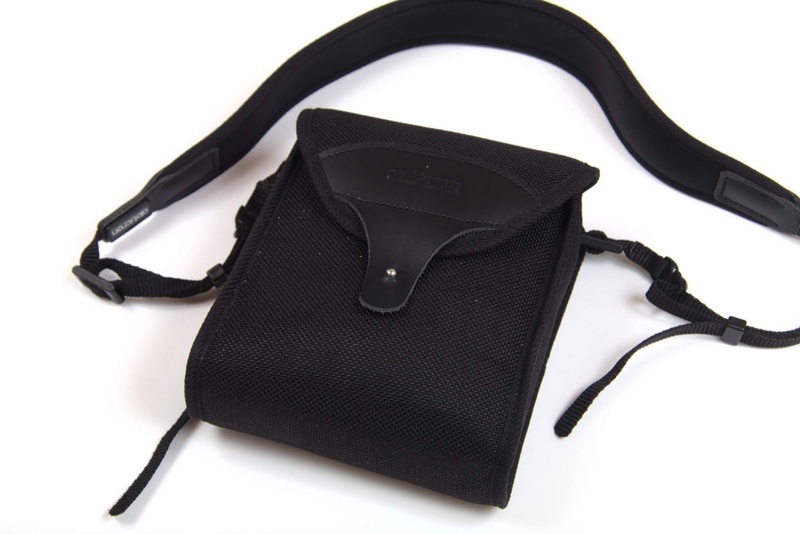 The idea is that there are cut-outs so that the binocular strap acts as the case strap as well. This might be OK, except that the fastener on the case is pretty useless. It is a sort of metal button, over which you are supposed to press a slit in the leather tab on the lid. It turns out that it is very difficult to fasten this properly. The case is soft and the fastener falls over the gap between the barrels of the binoculars, so when you try to press the flap over the stud, it just sags into the gap and it is quite a struggle to get it on satisfactorily. Then, if you try and pick up the binoculars in their case by the strap, and the flap is not fully fastened, all that happens is that you pull the bins out of the case! This has happened repeatedly! Secondly, consider the strap. 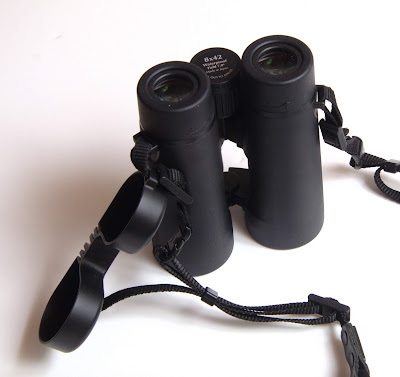 The old strap was simple - just a broad neck strap with two narrower, nylon webbing pieces at each end to loop through the lugs on the binoculars. The new "neoprene bungee strap" is more complicated. 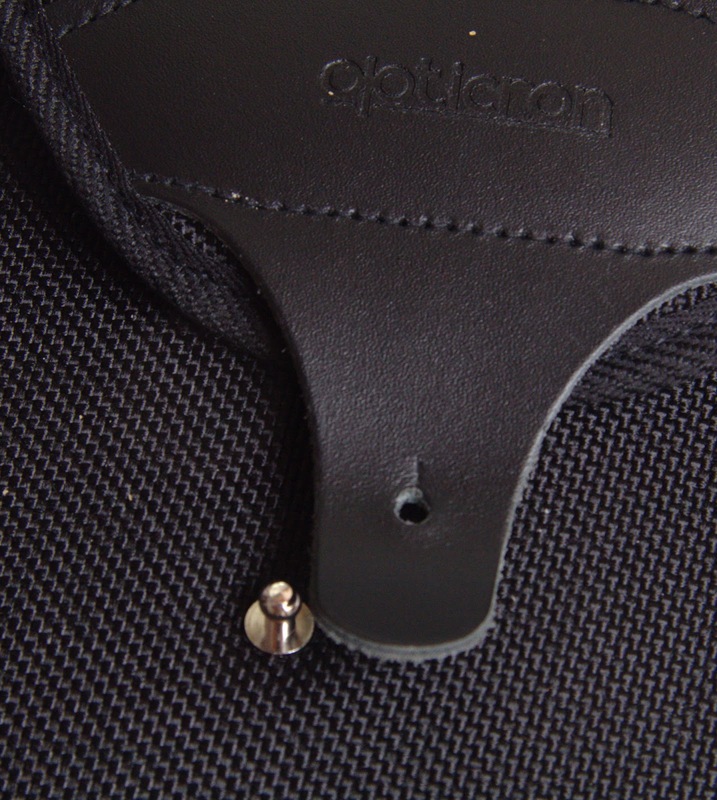 It has a broad neoprene neck strap with narrow nylon webbing pieces at each end as before, but these are terminated in quick release buckles. 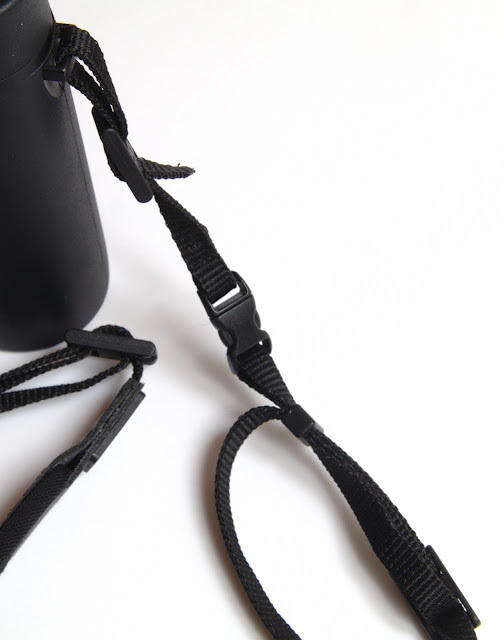 The other end of the quick release has another narrow nylon webbing strap which goes through the binocular lugs. 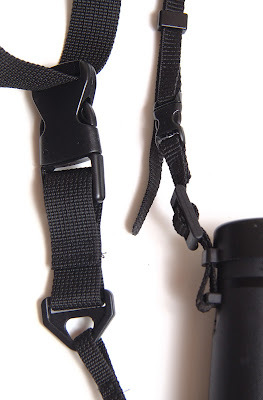 The problem with this is that, either side of the quick release, there is a bar-buckle that fasten the loop of webbing that goes through the loops on the quick release buckle on one side , so that its lengths can be adjusted, and a second one to fasten the loop that goes through the binocular lugs on the other side. These bar-buckles tend to slip - especially the one nearest to the binocular lugs. Normally, I would put the strap through the buckle an extra time, but the bits of strap nearest to the lugs are too short to allow this. This has been a real problem - I have had the strap come undone almost daily because the fastening of the loop that goes through the binocular lugs has slipped. This despite my best attempts to thread it back through the bar-buckles an extra time to stop it slipping. 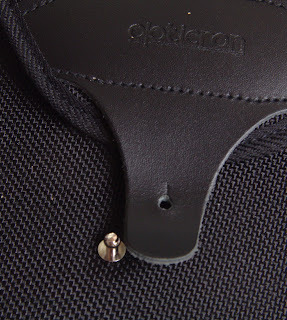 I really do not understand why Opticron decided to put the quick release buckle in this strap! What function does it serve? All it does it make three points of failure into each end of the strap instead of just one in the old style strap. Opticron do a harness which has a quick release system. It seemed logical to assume that the quick-release on the bungee strap would be compatible with that on the harness so the bins can be quickly switched between them. But this is not so! The quick release buckle on the harness is much wider than that on the bungee strap. So why they put a quick release system on the bungee strap remains a mystery! In conclusion, the new binoculars are great and I would thoroughly recommend them, but the case and strap they are supplied with are not so good. In particular, the strap has been a right pain so far - it keeps coming undone. For that reason, and also because it might help holding the bins still with my shaky hands, I have decided to replace the neck strap and try out the harness. Once I have had some experience with the new harness, I will write a review of that too. 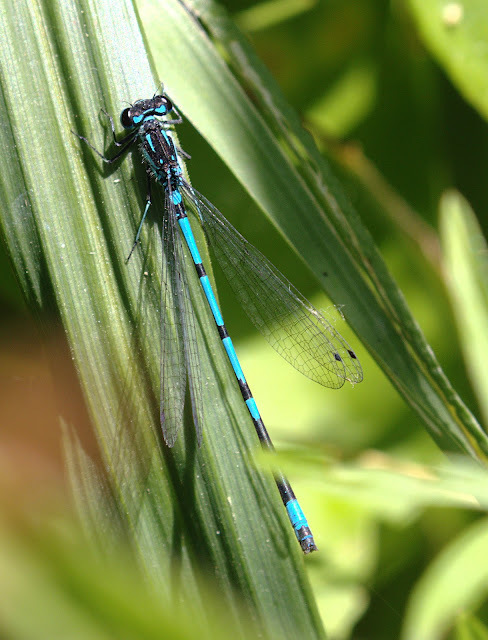 The Variable Damselfly is an uncommon species which occurs in widely scattered colonies throughout Britain but it can be abundant where it occurs. This picture was taken at Baston Fen in South Lincolnshire - a well known and good site for the species - on 3 July 2018. I have seen the species at a few other sites in the region around Peterborough, but most consist and abundant at Baston Fen. In general, I would say it looks a bit daintier and darker than the very common Azure Damselfly (C. puella) with which it tends to occur. Males are fairly easily separated: the mark on the 2nd abdominal segment is typically shaped like a wineglass in C. pulchellum (but like a tumbler in C. puella - i.e. "U" shaped and not connected to the basal black band of the segment); the antihumeral stripes (the pale stripes running longitudinal down the thorax) are interrupted in C. pulchellum (broader and continuous in C. puella) and the 9th abdominal segment is mostly black with only a narrow, basal blue stripe (9th segment half or more blue in C. puella). 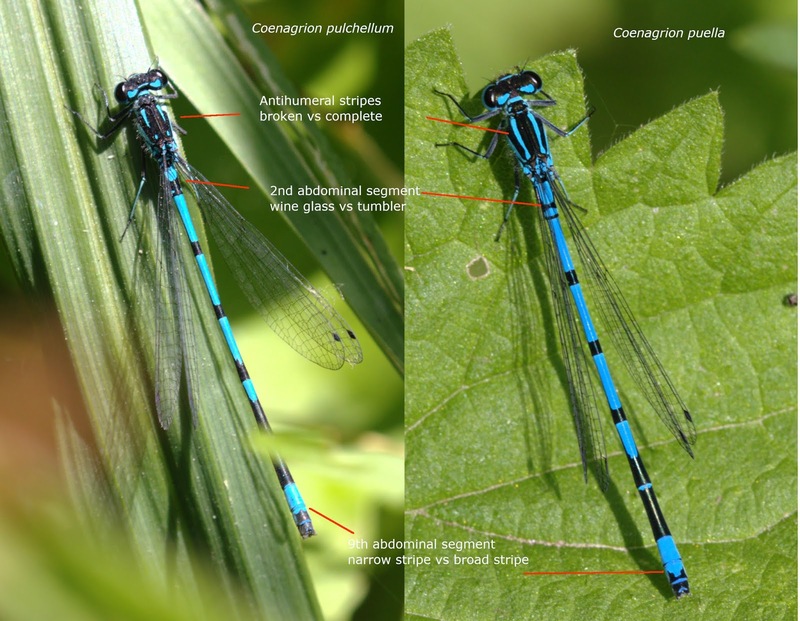 However these features are quite variable (hence the name - Variable Damselfly!) especially the shape of the mark on the 2nd abdominal segment of the male. Conditions in the garden this afternoon were warm but overcast. I was taking some available light pictures of insects coming to Marjoram flowers (Oreganum vulgare). I was trying to maintain a fairly high shutter speed (1/400 - 1/500) because I was hand holding the camera with a 100mm macro lens and at an aperture of F6.3 or F8. To achieve this, I had to let the ISO go quite high. 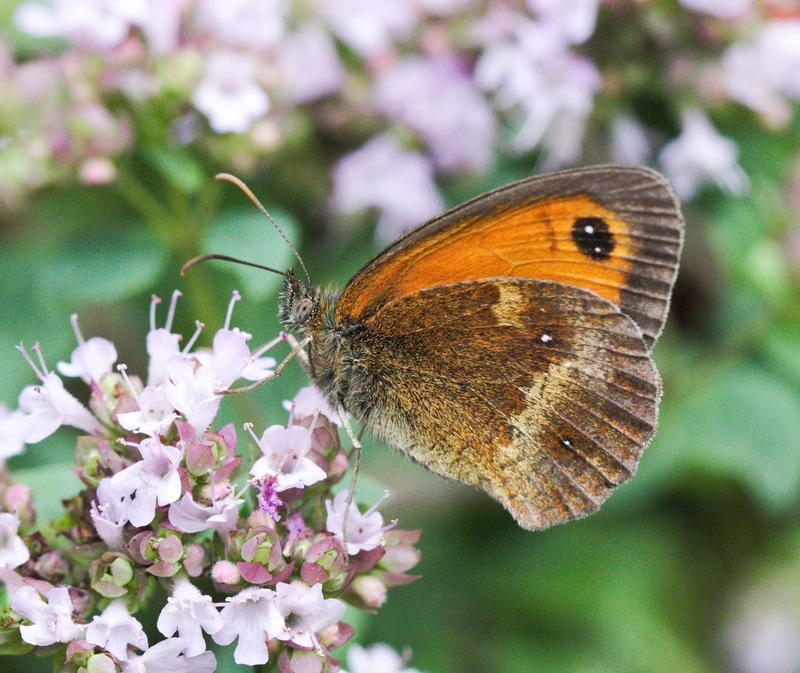 Here is an example of a shot of a Gatekeeper taken at ISO 4000 (1/500s, F6.3). This is a somewhat cropped version (3675 x 3090) of the RAW file (Canon's .CR2 file format - 6000 x 4000) as rendered into GIMP 2.10.2 by the default settings of nufraw. 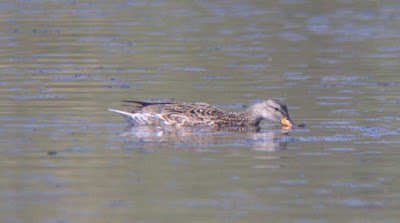 Whilst noise is evident on close examination, I think the image is quite usable and is pretty impressive for ISO 4000. I have loads of old 35mm slides, mostly from my days of film photography using the Olympus OM2 system, but also some even older. There are some good wildlife photographs here as well as stuff of historical, family and personal significance. Over the years, I have used a number of means of capturing these including a CanoScan III film scanner, a "Compact Digital Film Scanner" from Jessop's and a 35mm holder for a flatbed scanner. None of these have been particularly satisfactory and none of them work with my current hardware. Be that as it may, there are times when I want to recover images from my old slide collections. 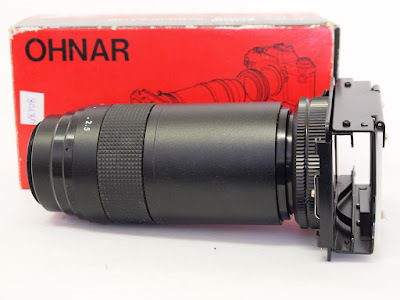 So I have recently tried yet another approach: I have an old device - an "Ohnar Zoom Slide Duplicator" by Bush & Meissner Ltd. I don't remember when I bought this, but probably in the 1980s. It is designed to fit on a 35mm SLR camera using a T2 mount - and mine has an Olympus T2 mount, so clearly dates from my Olympus OM2 days. The 35mm negative or slide goes in the holder (at the right hand end in the photo above) and the whole device is pointed at some bright light source (e.g. an electronic flash). The holder has a translucent white diffuser built in. The holder allows the slide to be moved from side to side and can be moved up and down and rotated. The device also has a built in 1 - 2.5x zoom. So it is possible to photograph the whole slide or any portion of it. A problem is that this device was designed for use on a 35mm SLR. I expect that it would deliver an image of the whole 35mm frame when on a full frame DSLR body but, mounted on a crop sensor DSLR such as my Canon 80D, the minimum magnification is effectively 1.6x (the body's crop factor) and it is not possible for me to capture the whole frame. In practice, it mounted easily enough using a Canon T2 mount. I find that a good exposure is only achieved by trial and error, which when using a DSLR, is not a problem. I simply inserted a slide, pointed one of my Yongnuo 560 III flash guns at the diffuser, put everything on manual, set the ISO to 100, shutter speed to 1./250 (the flash sync speed of this body) and then took a series of trial shots, adjusting the flash power each time until I got an acceptable histogram. I find that the density of slides varies quite a bit, so the flash power needed for a good exposure varies by at least a stop either way between different slides, but typically around 1/16th power. The main problem I have encountered with all of these devices (and this is no exception!) is that they tend to significantly increase the contrast of the image. Even using the best method and exposure, the resolution and dynamic range of 35mm colour slides are not actually very good compared to what we have become accustomed to with modern digital images, so the resulting images are rather disappointing whatever the capture device. The Dolichopodid fly Poecilobothrus nobilitatus is a common species which can be abundant in the right conditions. It likes the shallow, muddy edges of pools and streams and even muddy puddles in dappled shade. 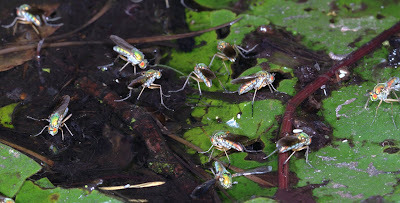 Dolichopodids (long legged flies) have extravagant external male genitalia, they are typically colourful with metallic green and blue colours and iridescent eyes and the legs of males are often ornamented. In this particular species, the males, which are about 5-6 mm long, have the wings blackened over the outer half and milky white tips. 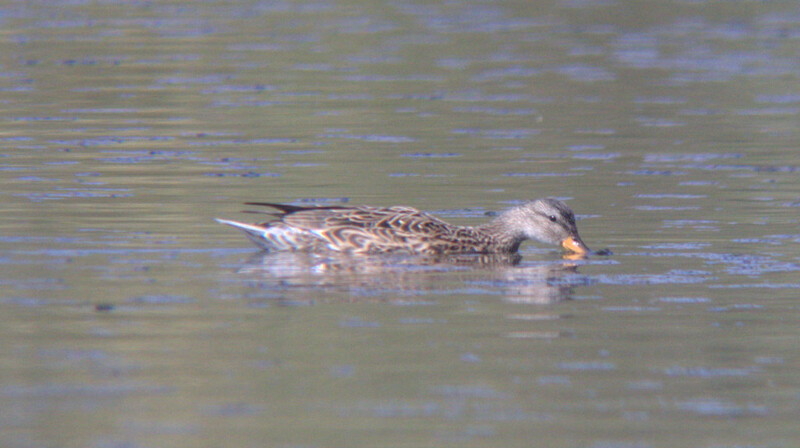 Females are usually a bit duller and lack ornamentation. In this species, the wings are not coloured. 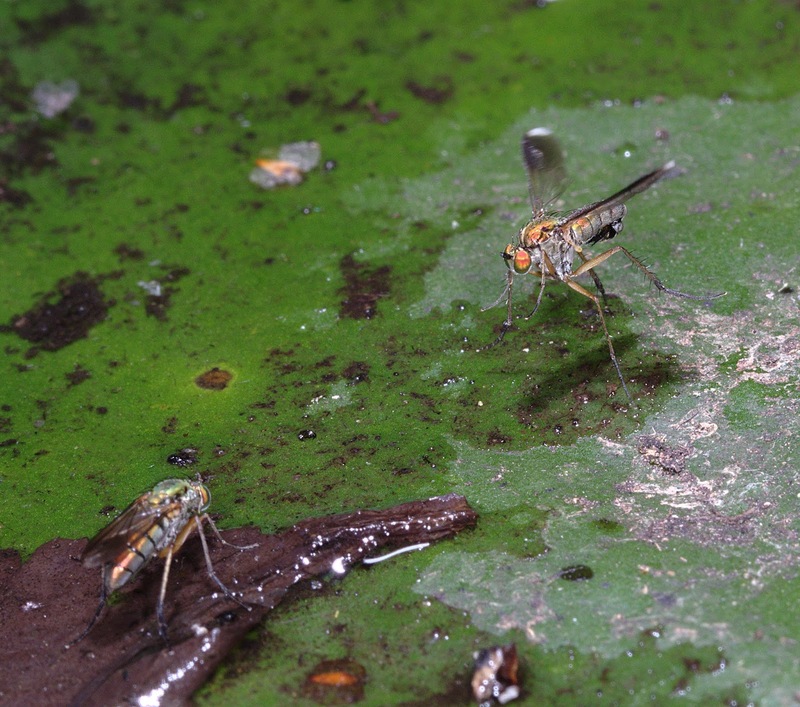 During courtship, Dolichopodid males semaphore with there ornamented legs, or in this case, their coloured wings. In this species, courtship takes place on the surface of wet mud or water. 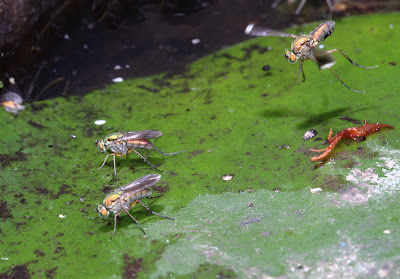 At the start of a courtship bout, the male approaches a female and and waves its wings in short bursts when a few centimeters away, it then jumps over the female and repeats from the other side. 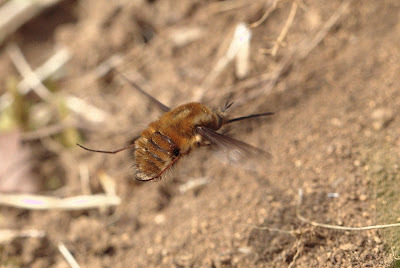 If the female shows any interest, the second phase involves the male hovering in a short, wavering flight, in front of and to either side of the female. There is a small pond in my garden in the shade of a Scot's Pine tree. This obviously provides the right conditions for P. nobilitatus and large numbers are present at the moment - and courting furiously. 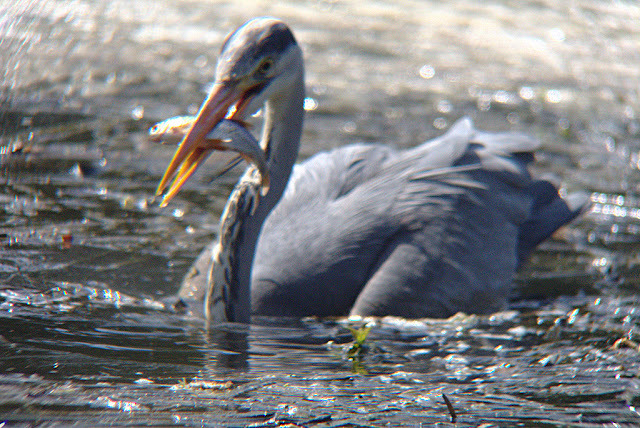 I wanted to try and photograph this courtship behaviour, but I knew it would be difficult. The flies are small and, to get a good image, would need a reproduction ratio close to 1:1, which means getting quite close. At these short distances, the rapid movements involved would make it very difficult to capture. In these circumstances, electronic flash provides sufficient illumination to achieve the small apertures necessary for the depth of field and also the short duration of the flash has a chance of freezing the movements. 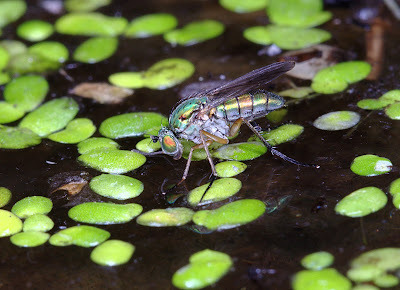 Photos were taken using a 100mm macro lens at around f16. The main illumination was from Canon MT-24 dual flash with a Yongnuo 560 III providing background illumination. A Yongnuo RF605C radio unit was used to trigger the background flash. The Canon 80D camera was set in manual mode and the flash power set as low as possible - around 1/8 or 1/16 power. 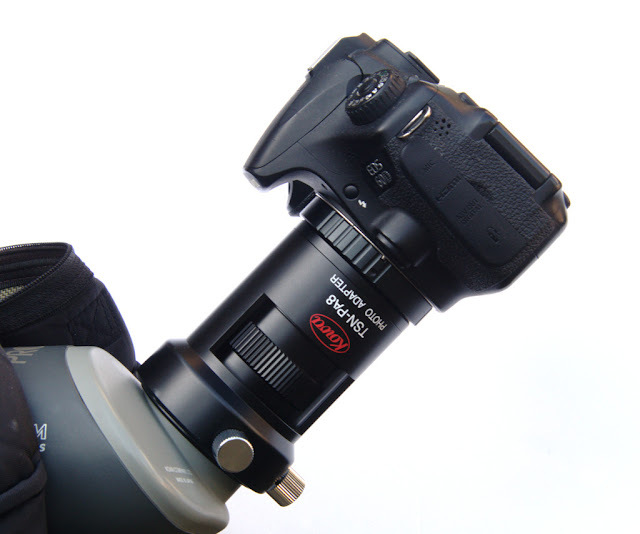 This reduces the flash duration allowing for high speed imaging. The maximum flash sync speed for this camera is 1/250th sec, so the shutter speed was set to 1/250 or 1/200th. At 100 ISO, f16 and 1/250 sec, the available light level would lead to underexposure of about 4-5 stops, so the exposure is totally due to the flash, therefore the camera's shutter speed is irrelevant (providing the shutter is fully open when the flash fires). 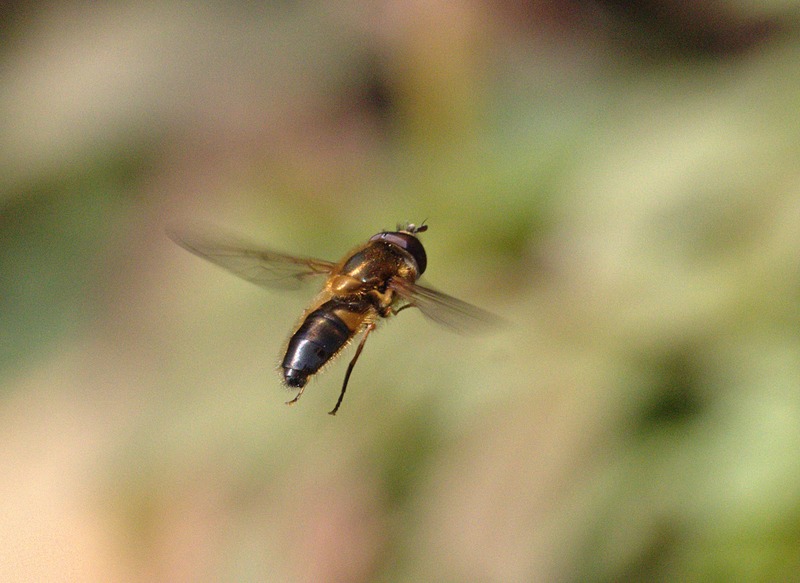 Taking pictures of flies in flight is rather challenging. 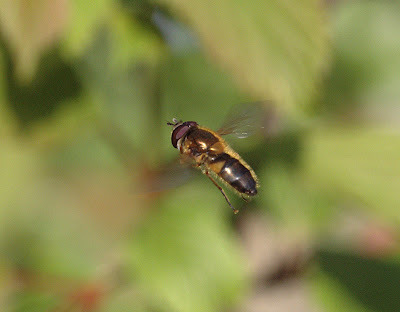 Hoverflies are a little easier than some others because they hover in one place for a few seconds at a time. 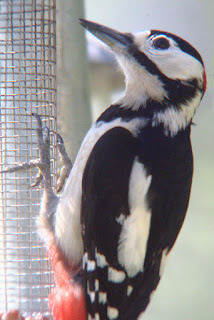 Males are territorial and tend to repeatedly return to a similar air space. 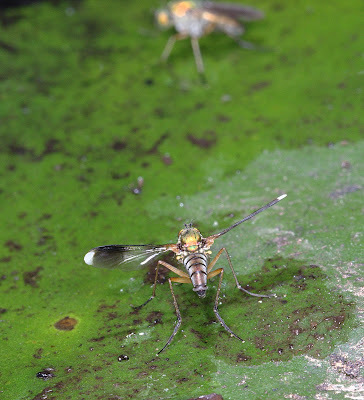 Epistrophe eligans is a common, early spring species in which the males lek. A group of males tends to form a loose cluster around the end of a branch and jostle for position. These were taken at a reproduction ratio between 1:1 and 1:2 so, even with a 100mm macro, it is still necessary to get pretty close to the fly to focus. Auto-focus is of little use in this situation. It is better to switch to manual focus and focus by rocking backwards and forwards. A small aperture is necessary to get enough depth of field. These wee taken at F11. A fast shutter speed is also necessary to stop motion of both the fly and the camera. Even in bright sunshine, a high ISO will be necessary. So the camera (Canon 80D) was set in manual mode (M) with 1/1000s and F11 dialled in and the ISO set to "Auto". I used high speed shooting mode to take brief bursts of shots when the fly came into focus through the viewfinder. The Beefly, Bombylius major, is another common early spring species that hovers, although not as persistently as a hoverfly. The following shot was taken using similar techniques. 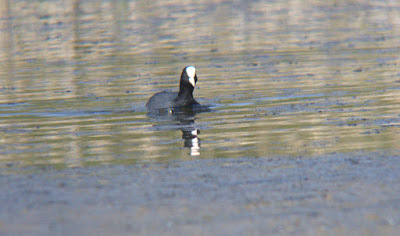 I have previously written about digiscoping using a 50mm lens on the DSLR camera body. However, an alternative is to mount the camera body directly on the telescope, using the telescope's optics as the lens system. My scope is a Kowa TSN-823M, which is a fairly old scope that is no longer in production. Kowa have offered an adapter of this type (TSN-PA7) for their current 'scopes, but their adapter for the legacy range of 'scopes - including mine, is a bit more recent. This is the TSN-PA8. 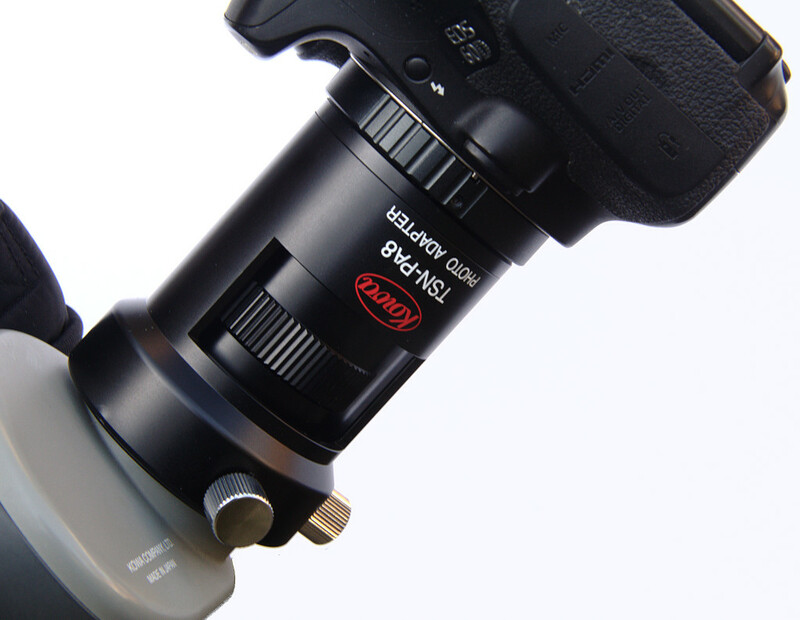 TSN-PA8 mounted on the 'scope eyepiece with Canon 60D fitted. 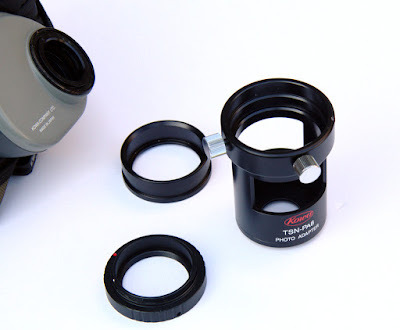 The adapter is in two parts: a collar that screws on to the accessory mounting thread around the eyepiece aperture of the telescope and a tube which fits over the eyepiece, slips onto the collar and is held in place by a pair of screws. The camera is mounted using a T2 mount which screws on to the outer end of this tube. 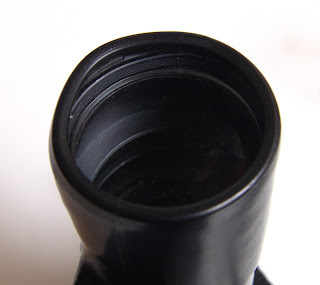 The outer end of the tube is closed by a piece of coated, optical glass which covers the eyepiece and prevents any muck, dust or moisture which might be on it from getting into the mirror box of the camera and hence on to the sensor. This was added to the PA7 adapter about 2015 (and it became the PA7A) but, as far as I know, has always been a feature of the PA8. The assembled mount in position over the eyepiece. Note the optical glass covering the end of the eyepiece to prevent anything getting into the mirror box of the camera. The cut-outs on the side of the tube allow access to the eyepiece's zoom ring so that you can still operate the zoom whilst the camera and adapter are in place. Ports in the side of the tube allow access to the eyepiece zoom ring. Overall, it is a well made and well designed, if rather expensive, piece of kit and does the job of mounting a DSLR on the 'scope very well. It is fairly quick and easy to fit. 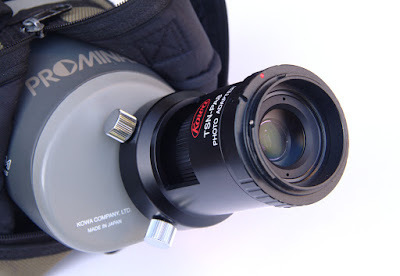 Swap the camera lens for the adapter, slip it over the eyepiece and do up the two securing screws and you are ready to go. The camera can be oriented either horizontally, in landscape mode or vertically, in portrait mode, just by loosening the screws and twisting and, unlike my previous DSLR digiscoping setups, the zoom function is accessible whilst the camera is mounted. 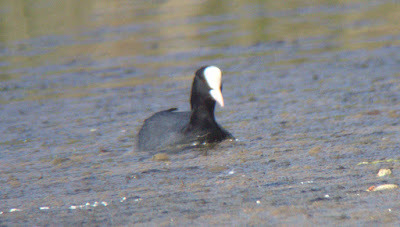 In use, the usual problems of digiscoping remain. Firstly, the field of view is very small, so finding your target is often quite difficult and it can be rather tricky to keep a moving subject in view. Secondly, the magnification is considerable and the whole setup rather cumbersome, so camera shake is a big problem. It needs a pretty fast shutter speed and you really want to trigger the shutter without touching the shutter button. I usually use either the 2 second delay timer or the Canon RS-60E3 remote shutter release. I find one difference with my previous digiscoping attempts is that I don't get any vignetting, even at the lowest zoom magnification setting. According to info on the Kowa web site, at minimum magnification this set up is roughly equivalent to a 1200mm, F12 lens on a 35mm camera and a maximum zoom a 2900mm lens at F34. On an APS-C sensor camera like mine, you need to multiply these focal lengths by 1.6x to appreciate the sort of reach you get. At these very small apertures, even on a bright day, a pretty high ISO is needed to get a decent shutter speed. I usually try to stick to 1/1000s to counter subject movement and camera shake, so the ISO rarely goes below 1600. I put the camera in manual mode (M), set the shutter speed to 1/1000s and select Auto ISO. I generally find I have to dial in between minus one and minus one and two third stops compensation to get a correct exposure, otherwise the metering system seems to over-expose everything. I am not sure why this should be so. Focusing is, of course, manual and done with the telescopes focus knob. If the subject is fairly static, live view is very useful for adjusting the focus accurately. I use as much magnification as I can get on live view to critically set the focus. Otherwise, make sure that the dioptre setting on the viewfinder is properly adjusted for your eyes before you start and focus as best you can visually, through the viewfinder. You don't get a lot of depth of field, so I generally take a series of shots, adjusting the focus each time - unless I have been able to set it up accurately on a static subject using live view. These examples are derived from straight RAW shots taken using my Canon 80D on the setup described, at minimum zoom unless otherwise stated. 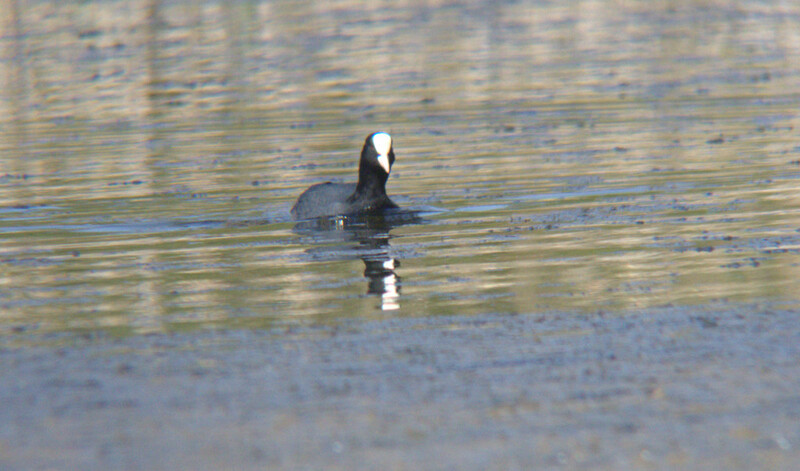 These two shots of a coot were taken seconds apart, the first at minimum zoom and the second at maximum. I find that shots taken at higher zoom levels are always rather soft. I think this is because diffraction becomes a very significant issue at such tiny apertures. This shot of a Heron catching a fish illustrates the problems of capturing action with such a cumbersome setup and without the benefits of auto-focus. Here, I haven't got the focus quite right - I think the plane of maximum sharpness is just in front of the bird and, despite the fast shutter speed, camera movement is obvious (I think I jabbed at the shutter button with my finger to try and capture the moment! ).